To mark the Centenary of Armistice, Forgotten Veterans UK have produced this stunning publication which contains 25 of the Great War poems alongside modern pieces by FVUK members and supporters. 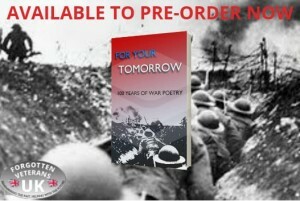 This isn’t just a book of poems, from the start to finish the historical pieces along with the poems take the reader on a journey through the Great War exploring the highs and lows of this terrible conflict along with stunning graphics and pictures from that time. The First Edition print of For Your Tomorrow will be a limited print number so for your chance to own one please show your interest by completing the pre-order form below. Priority for this First Edition will be given to those that register. All profits from this book go directly to supporting Veterans in need.